The Green Phone Booth is excited to present the following guest post. This post is a little different from previous guest posts as today's poster has asked to remain anonymous. She does not want anything discussed here to affect the corporate office of her husband's franchise or other franchisees. The door to the restaurant opens. My husband smiles and greets a man who has come in several times before. We are grateful to have repeat business at our new restaurant. Do you believe that local businesses are important to support local economies? Our restaurant supports the local economy. My husband chooses his own vendors. Our locally-owned food supplier buys many items from local farms. Our many and varied signs are designed and printed by two men who likely founded their company decades before Photoshop was created. A small, local general contractor did our build-out, hiring a lot of local sub-contractors to sand, paint, stain and otherwise transform the space. A local real estate agent — actually one of my husband’s college buddies — profited from the lease agreement. The 40 or so images that decorate our restaurant were framed by a man who operates his framing business from his basement; my father-in-law knows him because they attend the same church. We’ve also created jobs for 15 local people during a very difficult economy. Our employees include two high school students; several college students; two dads who are paying child support; and my 25-year-old brother-in-law, who earns enough to pay rent and buy groceries while he works as an unpaid youth minister at a brand new church. Our restaurant — and the four additional restaurants we hope to open — should also support our family and provide a retirement for my in-laws, who have invested significant capital in the business, not to mention the hours they work so my husband can have one day off each week and he can work 12-hour days instead of 16-hour days. Do you believe that local is more eco-friendly? As a person seeking to live a little greener, I know we all struggle with all the shades of gray in our green lives. I understand the sentiment that buying local is important. But it is difficult to see the no-questions-asked anti-franchise sentiment — to wonder if it is hurting my family's livelihood and that of other hard-working business owners who've bought into franchises — and I'm struggling with the arguments surrounding it. My husband is chasing his dream. He owns his own business — a neighborhood restaurant. He is in his element: serving customers, cooking new dishes, planning events, meeting local business people, and even balancing the books. I wasn’t particularly driven to own a restaurant. The risks are very scary to me. But how could I say “no” to my husband’s dream? And so I am part owner in a great little neighborhood restaurant. As someone with a growing dedication to living sustainably, I see areas where we can make our restaurant greener. My husband is filing my suggestions so he can consider them when we get past survival mode. He also listens to customers concerned about sustainability, and he explains the dilemmas he faces. For example, he recently had a customer ask if he uses free-range chicken. When he told her the increase in the price of one of our chicken dishes if we used free-range chicken, she admitted she wouldn’t pay the difference. The efficiencies and sales volume at these restaurant chains allow these large companies to reduce their footprints with technology that is currently cost-prohibitive for smaller companies. I hope that these large companies continue to test energy-efficient products and lead the way for the entire industry to become greener. I commend these companies for participating in pilot programs so that all restaurant companies can benefit from the information they are willing to share. So which restaurants are corporately owned and which are locally owned? Aside from asking someone who works at a restaurant, there is no easy way to tell which businesses are locally owned and which ones are corporately owned. Many large restaurant companies have both corporately-owned and franchised locations. Starbucks — which does not franchise — is renaming some stores, like 15th Avenue Coffee and Tea in Seattle to give them more of a local identity. All I ask is that you wrestle with the meaning of “locally-owned” before you eschew any restaurant in your city because it has a national or regional identity. Our franchise company serves as a mentor and an advocate. We have someone looking out for our interests. Someone who helped us with site selection and build-out, someone who gave us a list of materials we would need to buy and suggestions for vendors with the best prices, someone who provided trainers for our first two weeks, someone who helps us marketing, someone who advises us on landlord situations. We need this expertise to make a success of our family business. But we operate as an independent and locally owned company. We live simply. We just want enough to earn enough to support our family and my in-laws. My husband and I would like to save for retirement and to put our kids through college. As for the restaurant itself, we’ve loved becoming a part of the business community and the neighborhood. We have our “regulars” now. How cool is that? Like any restaurant, we’re looking to serve the best food possible, to be as efficient as possible, to provide the best customer service, to treat our employees fairly. I just hope that the “buy local” supporters give us a chance. And someday, maybe we will be able to afford solar panels and free-range chicken. I could smell the fire. It's scent lingers in my hair, my jacket, the clothes packed away in the back of the car. There's something special about camping to be sure but even more, about the campfire. It is often the only thing souvenir from a camping trip. And this time, it was all mine. I didn't grow up camping but, since I hit college, I've been on a fair number of camping trips. Funny thing, though, in all those camping trips, I've simply been along for the ride. Someone else makes the fire. Someone else does the cooking. I simply eat and help clean up. Not this time. Last fall, Burbs had advised me how to reconnect my boys with nature in two words: CAM PING. I took her seriously. We spent the next several months investing in camping equipment and making reservations. Well, last weekend was first up. My first camping trip as the only adult responsible for cooking. As we hadn't yet found a camping stove on Craigslist, it was all about the campfire. But what does one cook over a campfire? My husband fondly remembered something he called a hobo. Something about a baked potato and vegetables. Sounded perfect so I did a few Google searches to see how exactly how to hobo a hobo. Well, hobo me because a hobo apparently is all about the meat. Not this hobo! As a 100% vegetarian hobo, I passed on the fond memories and the smell of beef over the campfire. Social networking to the rescue! With some more research and the help of my tweeting and Facebooking friends, I compiled an armory of vegetarian campfire meals. From regular Phone Booth guest poster and photographer extraordinaire, Sweet Eventide, I got the simple and delicious suggestion of a foil pouch filled with veggies. We did this, by the way, with homegrown tomatoes, summer squash and a farmers' market carrot, oh, and some feta cheese too!! Yummy. Two Frog Home leapt in with thoughts of veggie shish kabobs and a tasty dipping sauce. Call me a kabob but that sounds divine. It didn't make it into the fire on this camping trip but, shish, I smell some wonderful kabobs in our future. 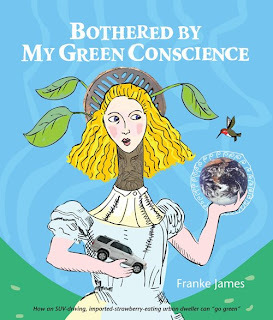 Green Me served up on heck of a website. One Pan Wonders has a whole section on cooking vegetarian while camping. Holy Cous Cous, Batman! That Carrot Orzo sounded fantastic. Lacking some of the key ingredients and the time to go get them, I decided to pass on any of these recipes until next time. Cannot wait to try some of these dishes. Green Resolutions kept it simple. 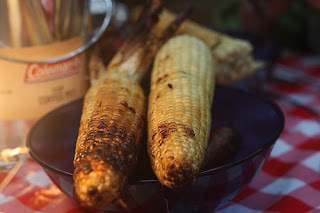 "My favorites include potatoes cut into chunks, wrapped in foil and set in the coals to cook; corn still in husks - pull husks back, soak in water for a few hours, pull husks back, tie husks to hold water in and grill; and apples, cut in chunks and cooked until it starts to caramelize." We decided to do a taste test with the corn. Two cobs using Resolution's method of husk on and two cobs cooked in foil. It's probably no surprise which one tasted better. (Hint: au natural). Cstn85 suggested sticking as close to camping traditional as possible and going with a tofu pup. She commented how, despite being vegetarian, there's nothing like watching a hot dog pop and sizzle over open flames. We couldn't agree more. The kids did the roasting and there were no dishes to wash. What could be better? Allie of Allie's Answers had some answers. "Portobello mushroom 'burgers' are always good." I'm sure they are but as Mr. Green Bean is afraid of Portobellos, we had to pass. Her other suggestion, though, is a surefire winner: campfire pizza! Okay, so we didn't make this either because I gave away the darned pizza stone in a decluttering fit. The good news, though, is that I gave it to a family member who still hasn't used it. No reason I can't ask for it back, right? And, to top it off, anything for dessert other than the traditional s'mores? 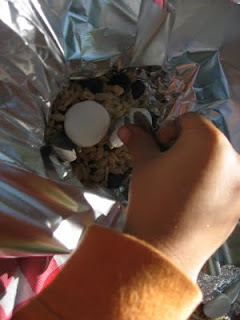 Make It From Scratch recently posted a recipe for Campfire Delight. It's made of berries (or probably any other fruit in season), marshmallows, oats, puffed rice cereal, and chocolate. As the chefs, my kids, can attest. It was a delight! Thanks to all my online friends for filling our campfire with non-carnivorous wonders. 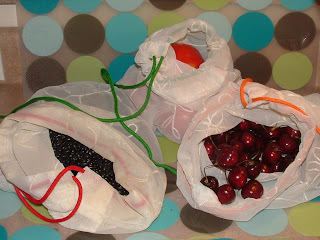 The Conscious Shopper gives an old shower curtain new life as some produce bags. My farmer's market is not one of those that are trying to go plastic-free. After a couple years of only using cloth bags and letting my produce go naked at the grocery store, I was pretty peeved the first time I visited the farmer's market and brought home a bundle of plastic bags. I tried getting around it, but the farmers didn't like juggling all the produce I handed to them to be weighed, and more often than not, they slipped my items into plastic bags anyway. Those farmers are just so darn nice - how could I reprimand them for their plastic bag addiction? For the past year, my solution has been to reuse plastic grocery bags at the farmer's market. I used the same bags over and over again, trying not to bring any new bags home. 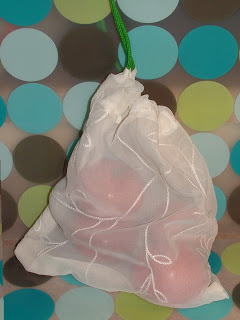 This method worked fine, but plastic bags tear and get dirty, and I'm sure I went through more plastic bags over the past year than I would like to admit. A few months ago on my personal blog, I wrote about how I was starting to use the bulk bins at Whole Foods, but I needed to get some cloth bags for them. 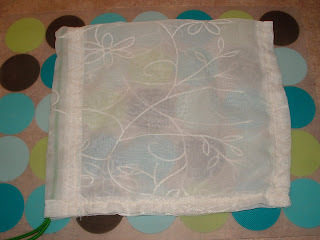 A reader commented that she had made her own bags out of an old shower curtain. Brilliant! It just so happened that I had an old shower curtain lying around. So the next time I visited my mom (who is a sewer extraordinaire and also happens to own a sewing machine, which I do not), I whipped up some cloth produce bags. The finished product is sheer, lightweight, completely free, and oh so adorable. Here's how I did it (but please pardon my sewing skills, which are not great). STEP 1: Obtain an old shower curtain. If you don't already have one lying around, you can find one for very cheap at a thrift store. If possible, go for a sheer curtain to help the farmers and cashiers tell what's inside. STEP 2: Using a ruler, mark rectangles measuring 17" X 26" onto your shower curtain. 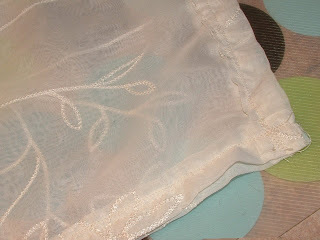 (Remember that with the hems and slot for the drawstring, you'll lose several inches. The final bags end up being about 13" tall by 12" wide.) I got six bags out of my shower curtain. STEP 3: Cut out a rectangle. STEP 5: Fold down one of the longer sides of the rectangle 2". 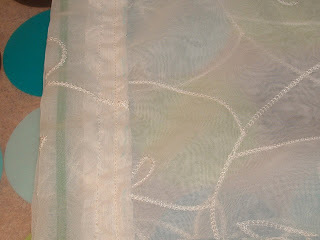 Pin in place and sew using a straight seam. This will form the channel for the drawstring. STEP 6: With wrong sides facing out, fold the rectangle in half and pin in place. The fold becomes one side of the bag. 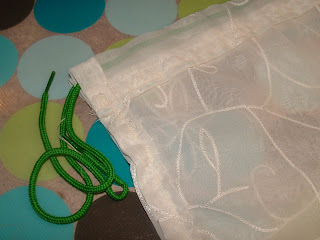 Sew around the other two sides of the bag, leaving a slot at the top to push the drawstring through. Obviously, don't sew the bag closed at the top. STEP 7: Push a string through the channel you made on the top of the bag. A shoestring works great for this because the plastic knob on the end makes it easy to push through. But any kind of string will work. STEP 8: Flip the bag inside out. STEP 9: Repeat with each rectangle. STEP 10: Take to the farmer's market or use at the grocery store for produce or bulk goods. When I used these bags at the farmer's market last week, several farmers commented on how pretty they are. I was pretty pleased to tell them that they used to be my shower curtain. Somehow, making something yourself makes it all the more fun to use. In her latest book, A Nation of Farmers (a book I was prepared to hate but am actually loving) Sharon Astyk argues that learning to cook is more important than learning to grow our own food. She points to previous generations where yesterday's leftovers were tonight's main course. Where people ate healthy for pennies and obesity was a non-issue. Sharon doesn't focus much on food waste but I've previously read that 40% of produce grown in the United States never makes it to the table. I, for one, have taken up the whisk and endeavored to slash the amount of food wasted at my home. I've become better about planning ahead and learned to combine recipes and substitute ingredients with glee. Most importantly, though, is that I've learned to use up what's left. I've learned to give the mushy melon and black bananas a home other than the compost bin. Here are a few of my most successful tricks for heading food off at the rotten pass. SMOOTHIES: Smooshie strawberry? Bloated blueberry? Those and all other overripe or under-sweet fruits can find a home in a homemade smoothie along with whatever juice, yogurt or dairy is in the fridge and on the verge of yuck-dom. I also freeze my bananas (when we buy them) as they start to go bad - assuming they've not been transformed into banana bread. A friend swears by skinning the bananas and placing them in a reusable bag before freezing them. So far, knock on wood, I've done just fine by freezing them in their own skins and then thawing them slightly before easing the frozen banana out for a smoothie. Toss in some ice first, then the fruit and then whatever liquid you are using. Flip the blender switch and Jamba Juice is a thing of the past. 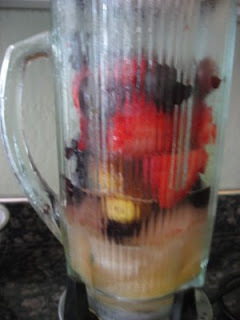 My kids love making smoothies and, in the height of summer, when we cannot eat through all the fruit before it starts to turn, we have smoothies several times a week. SALAD: A summer-time favorite is a salad that I call bruscetta. Tomatoes (any variety) are the star ingredient. The riper the better. I add a dash of olive oil, some flavored vinegar (balsamic, red wine or whatever), salt, pepper, and sugar (yes, trust me on this one but just do a dash). From there, anyone lolling about the crisper or growing in the garden is fair game. Radish, cucumber, pepper, cooked potato, onion, summer squash, fresh herbs, leftover cheese, what have you. Anything and everything gets diced up, throw in and mixed up. This dish is better if it has a chance to sit for a while. Then all the flavors meld together. Soak up the leftover juices with a slice of crusty bread. The Toby Show offers another take on the "clean out your fridge" salad - by mixing veggies with quinoa, or another grain. POPSICLES: It is finally hot here in Northern California and that means popsicle weather. I love this season because I can rinse out all my near empty containers without guilt - after swirling them with water and freezing it in a popsicle mold. I encountered the idea of using "jam jar water" for popsicles in The Tightwad Gazette last summer and wrote about it at my now defunct blog, Green Bean Dreams. We've since popsicled our way through many a jam jar, yogurt container or leftover smoothie all with the same delicious results. SPRING ROLLS: I know, I know. This is now the third post I've written on spring rolls but I'll just give a quick plug for those little rice wrappers. On spring roll night, I chop up whatever I find in the crisper and put it out as fillings. It's a great way to use up the lone summer squash or the random celery stick and the variety of ingredients makes the dish new every time we eat it. FRUIT SYRUP: I've mentioned my fruit syrup before but, while we're on the topic of overripe fruits, cooking them down with a bit of honey or sugar transforms what could have been compost to compote. Or, more accurately, pancake and waffle topping, flavoring for plain yogurt and, most deliciously, flavor for cream cheese coffee cake. SOURED MILK: When I'm not making homemade ice cream, ahem, we don't have a plethora of milk or cream around the house. Still, the time or two soured milk has lurked in my fridge, I've been happily surprised to find it is just fine for baking. I'm not alone in my affinity for soured milk delights. Milkweed Diaries offers up a recipe for soured milk pancakes which she promises are both yummy AND frugal. That's how this frugal foodie fights food waste. How do you do it? Friday I received a surprise package in the mail. Well, it was supposed to be a surprise, but being that my husband and I are soul-mates and think alike, I kind of spoiled the fun. Thursday in my email of daily adventures, I mentioned that I had ordered some stainless steel straws. You see, being all "eco" that I am, I often do crazy things in public like ask for no straw. Well, Monday was one of those days where I was straw-less, trying to drink a smoothie from my klean kanteen. I ended up with smoothie on my shirt and a pink mustache to match. I have known about the plastic-free options available for some time now (mostly due to Beth's raving about Glass Dharma), but it was not until that moment that I felt like a 8 year old drinking strawberry milk, that I decided to add a reusable straw to my eco-toolbox. I went straight to Glass Dharma and balked at the price. Holy cow! Those are way cool and I r-e-a-l-l-y want them, but man... I did not think hubby would appreciate me spending $40.00 on glass straws, so I looked for a more economic option. I found a set of four stainless steel straws on Amazon for $9.00. Deal!! Click, ordered. So I mentioned my order in my daily email to him. He replied saying cancel that order, you may have glass ones on the way! That is right... hubby bought me the glass set from Glass Dharma!! In the smoothie size no less. Great minds think alike, I tell ya! They arrived really fast. He placed the order on Tuesday and by Friday they had made the trip from California to my mailbox in Wisconsin. Which was great, because one day of anticipation was about all I could handle. There was no plastic packing in the box. In fact, there was no packing at all, just individual cardboard boxes for each straw. See, you can ship things without loads of peanuts, air bags, or other crap. Even glass! Aren't they beautiful? The dots are a nice decorative touch, but also serve a functional purpose - they keep your straw from rolling when placed on a flat surface. This set of four includes the cleaning brush. The smoothie size is large enough to easily rinse out. They are a lot fatter than I expected, maybe due to the smoothie size. They also have some heft. Their thickness assures me that I can confidently carry them in my toolbox purse without worrying about breakage. This set is 8 inches long. I have the 18 oz. klean kanteen. My straw barely clears the top. If your water bottle is any larger I suggest you order the extra long size. You have many options to choose from. They come in different lengths according to the sipping size you order: Sipper 7 mm x 6.25 inches, Ice Tea 9.5 mm x 8 inches, Smoothie 12 mm x 8 inches, Bubble Tea 14 mm x 9 inches. You can order with or without the dots. There are even straws with bends available. I have been using them incessantly since I tore into the package. I love them! Yesterday I got to test out the smoothie-ness with an organic strawberry smoothie at the Kickapoo Country Fair. Works great! I highly recommend getting yourself some. If you are shy about your eco-ness than you will not want to use these in public. They are a definite conversation starter! If you are out there to spread the good green word, then you need one of these in your toolbox. People ask. They are a great way to break the ice and offer a little education without force feeding unsuspecting strangers sustainability. On a side note... since I am an Amazon Prime member, my stainless steel straws had already shipped before I could cancel the order. I wonder what hubby will say about that? Ahhh... he loves me. I know you haven't seen me around as much lately. You're used to spotting me late into the night, scrolling through green blog after green blog for tales of victory over an unhealthy planet. But lately, my mouse clicks have led me elsewhere. Yes, it's true. I've started a new online relationship...with the crafty bloggers. How could I resist their creativity and resourcefulness? So much recycling, repurposing, and reconstructing! I was seduced by these men's shirts turned women's dresses...And these t-shirts turned sling bag...And if I had a daughter, this is definitely the dress I'd make for her...If only I could sew! My kids and I have been plotting to put up this adorable summer pavilion, made from an old sheet and newspaper bunting. And we've already started working up a collection of our own handpainted little people. But don't fret, Dear Green Blogosphere. As long as you keep reminding me that there's more to environmentalism than climate change and providing me with ways to introduce my children to the amazing outdoors, you will always hold the top place in my blogging heart. The Conscious Shopper experiences alternative green home-building. For the past few years, my in-laws have been building a hobbit house. That's what my husband and I call it. My five-year-old says, "Grandma and Grandpa live in a cave." 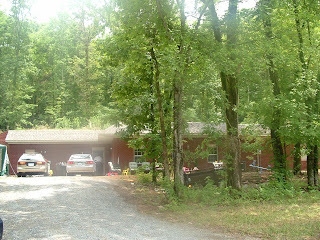 The house is way out in the country, set midway up a large wooded hill. As you pull into the drive, you might not realize that it's a hobbit house. With it's brick facade and overhanging eaves, it looks almost like any other house. But as you pull up a little closer, you might realize that the roof doesn't peak the way most roofs do. In fact, it curves a little bit. And there are plants growing on top. If you wanted, you could even climb up onto the roof. You could drag a lawn chair up there and sit in the shade, watching squirrels scamper up trunks and birds flit from tree to tree. You can do that on the roof of their house. I think that's freakin' awesome. The technical name for their house is earth-sheltered, referring to a house that uses earth as a form of insulation. There are earth-bermed houses, where the earth only covers one or two walls, or only goes halfway up a wall. 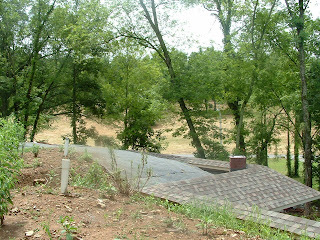 But my in-laws' house is earth-covered - three sides of the house plus the roof are completely covered in dirt. The method for building their house kind of reminds me of those paper-mache maracas all kids make out of balloons in elementary school. They started with three modular forms, poured concrete over the whole thing, and then removed the forms. What was left was a large ranch-style house made up of a living area with two bedroom wings. 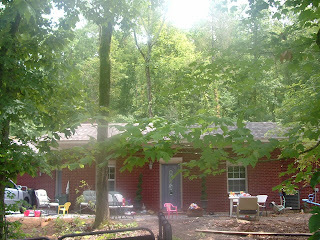 My in-laws added the interior walls, bricked up the front, poured dirt on top, and moved in. From a green perspective, this type of house has many advantages. But it's definitely not the perfect house for everyone. Energy-efficient. Like the earth it's built into, an earth-sheltered house will maintain a temperature of 60 to 70 degrees Fahrenheit throughout the year, especially when combined with a passive solar design. That constancy means that in the winter you'll use less energy to heat your home, and in the summer less energy to cool it. In fact, if 60 to 70 degrees is comfortable for you, you might not have to use heat or air-conditioning at all. An earth-sheltered home is a great style for off-the-grid living. Natural Landscape. Earth-sheltered homes blend into their surroundings and can create an amazing visual impact, such as this pristine house in England or this very Hobbit-looking earth-sheltered home. Less Maintenance. Because most of the walls and the roof are covered with dirt, earth-sheltered homes require less maintenance. No siding to paint, no gutters to clean, no termites to contend with. Protection against the Elements. A house made of concrete and steel with only one exposed side is going to be able to stand up to almost any kind of weather. Dark. I wanted to get a picture of the inside of the house to show how it looks just like any other house, except that it has domed ceilings in all the rooms. But the lighting was awful. My in-laws purposely designed the house to have few windows (they wanted a house that would last forever), so earth-sheltered houses don't necessarily have to be as dark as their house is. But because most of the exterior walls are covered with dirt, an earth-sheltered house by definition is going to be dark. Financing and Building. Getting the original financing to build their house was a huge pain for my in-laws. Because it's non-traditional, no banks wanted to finance them. Building the house has also been a headache. Contractors just don't know what to do with it, and my father-in-law has ended up redoing a lot of shoddy work. Difficult to Sell. My in-laws are building this house to retire in. And that's a good thing because there aren't very many people in the market for a hobbit house. Especially out in the boonies of Southern Tennessee. An earth-sheltered house might not be everyone's perfect home. But if you're the type of person who dreams of independence in an earth-friendly house, you could someday have a hobbit house of your very own. I know that we green types are supposed to "bloom where we are planted." We supposedly love tiny little houses squeezed in between other tiny little houses in an uber dense urban setting where mass transit, farmers' markets and recycling facilities are abundant. And, yes, I've read and re-read the country mouse post. I get it. Okay, maybe hate is a strong word. And it's not the whole house. Just parts of it. Big parts of it. I miss the vintage kitchen in my old house. The character, the temperamental Wedgewood stove, and the enormous make shift pantry that was born as a broom closet. I miss the spacious back yard in my new (yet to be found) house. The sunny spot for raised beds. The back corner cozied up with a chicken coop. The rugged climbing tree with a homemade tree house and the large (unwatered and totally chemical free) lawn big enough for the boys' dog (also yet to be found). Although we've lived here for years, I've never found space for all my things. The shelves above the washer/dryer bow under the weight of our towels and bedding. The one car garage - too small even for my husband's sedan - bursts with paint cans, last year's jam and chutney, small kitchen appliances, camping and exercise equipment and the "riding stock" (e.g., bikes). Yet, here we are. And, I suppose it is high time that I, like my garden, bloom where I am planted. With that in mind, I spent the weekend finding my space in this space. I cleaned. I reorganized. I let go of the meaningless, the unused, the clutter. I went a little Chile. 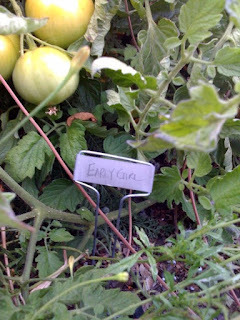 In doing so, I found fabulous metal stakes for labeling plants in the garden. I came across a wooden board and had Mr. Green Bean fashion it into a shelf for an armoire. I cleared out a garage cabinet and found a home for the canning jars. Some extra clothesline I came across along the way, plus some hooks and nails already in place, became home to those pesky canning bands. I rediscovered a vintage recipe folder, picked up at an estate sale years ago, and filled it with recipes. It turns out that, for most of my cookbooks, I've only found one or two recipes that I really use. Those recipes stayed, the cookbooks found a new family and the shelf found a bit of breathing room. 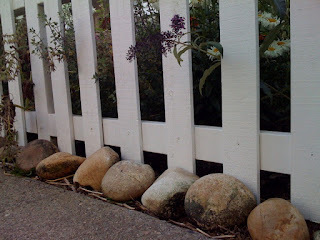 I unearthed a pile of river rocks and moved them (along with some supplements from Freecycle - someone else's decluttering) to the front of my Victory Garden fence. There, they hide the weeds and pretty up the garden. I found space in my closets, my cupboards, my pantry and my dresser. I also found a big ole pile of things that I don't really need after all. And I guess I found myself a garage sale, a load for the rummage sale or a Freecycle Rampage. My house, minus loads of clutter, plus some creative re-design without spending a dime? I don't hate it so much after all.